Much of the criticism of the PNG solution has focused on apparent inadequacies in PNG laws, economy, and infrastructure in settling refugees, and its crime rate. But let us be clear. The PNG solution is designed to stop the boats from coming. If it succeeds, of which there must be serious doubts, those issues will be irrelevant. The PNG solution is not practically sustainable should the boats not slow. At some point, PNG will say no to the carrot of massive aid and return our refugee “burden” to us. The main justification for such an unprecedented and harsh approach, according to many in the ALP, is that it must be cruel to be kind. That is, the boats must be stopped in order to stop the drownings. And this is a powerful argument – who supports drownings? Nor do I doubt the bona fides of many making the argument – many people support this policy for the humane reason that they cannot stand the idea of more people, especially children, drowning off our shores. And yes, if the boats stop, refugees will not drown off our shores. But, overall, will lives be saved? The intense demonization of people smugglers by politicians is blinding us to the agency and humanity of their clients. 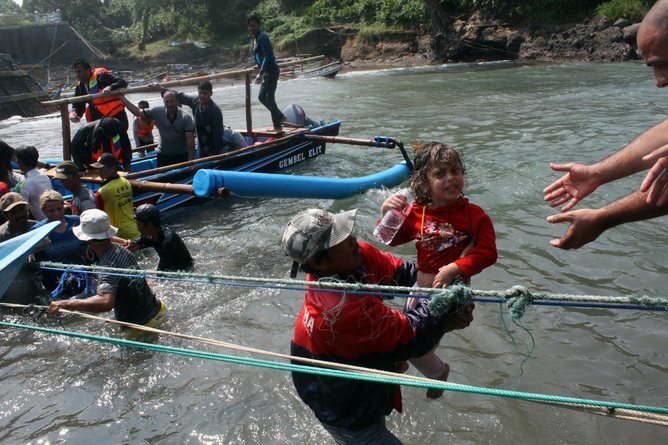 Asylum-seekers, most of whom are refugees despite the politicking of Bob Carr, are choosing to get on these boats. They choose because they have few viable choices. Their homeland is dangerous – returning or never leaving (an option which may increase with the shutdown of boats to Australia) can lead to death – just not off our shores. This photo, widely circulated on social media, demonstrates the absurdity of Australia’s advertising over the harshness of its regime in comparison with the barbarity of the Taliban for many Afghan refugees. Indonesia and other transit countries are limbo. Jessie Taylor’s film, Between the Devil and the Deep Blue Sea, details the desperation of the asylum-seekers stuck in that country, with no hope for the future, even if they are fortunate enough to have been assessed as a refugee by the poorly resourced UNHCR program there. In fact the majority may well not get on a boat. But many choose to – they are not unaware of the dangers but they prefer the risk to ongoing limbo. Our insistence that they must not get on boats may seem compassionate but it is also the sanctimony of the safe and the rich. And of course there is the “queue”, presumably the bursting refugee camps spread over the world. There is no legal obligation for refugees to go to a camp – nor are there signs and necessarily safe passages to such places. And then when one gets there – more limbo. Indeed, if Australia really bought into the idea of a queue, it would choose people purely on the basis of length of time in these camps. Yet we don’t. In these camps there is also often disease, crime, disasters and death. But death that does not occur off our shores. While Kevin Rudd and others may gesticulate over the “merchants of death” aka people-smugglers, they have a product that offers desperate people a chance at a viable and happy future. And they will continue to sell that product, to other venues, if the boats to Australia cease. And people will die crossing land and sea – just not off our shores. So personally, I do not believe these policies will save lives. But I am pretty sure they will ruin them. Sarah Joseph does not work for, consult to, own shares in or receive funding from any company or organisation that would benefit from this article, and has no relevant affiliations.